Mukesh gave no hint that he was leaving India's largest e-commerce player in a huff. 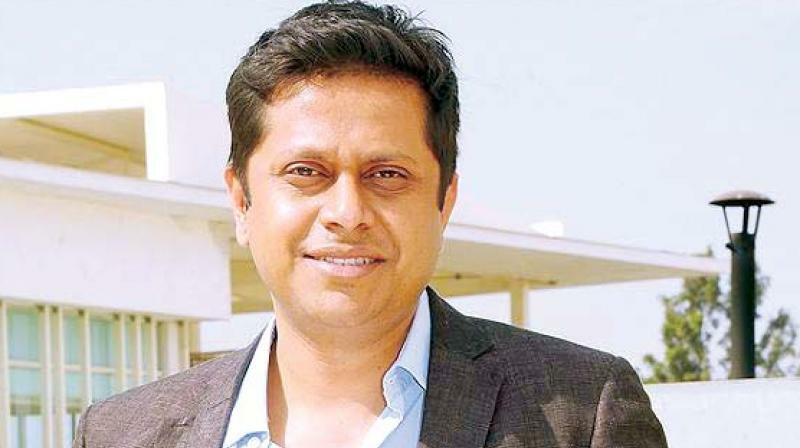 Bengaluru: “My two years with Flipkart has been nothing short of a fairy tale!”, wrote Mukesh Bansal to his colleagues on Wednesday, in a sudden announcement that that fairy tale had actually ended. On Thursday, as he spoke to Deccan Chronicle, Mukesh, who came as ‘the third Bansal’ to Flipkart when it acquired his fashion etailing portal Myntra for a rumoured Rs 2,000 crore, gave no hint that he was leaving India's largest e-commerce player in a huff, although market buzz insistently pointed out that barely a month ago, Flipkart had rejigged its top deck, making Sachin Bansal the company's chairman and sending his co-founder Binny Bansal to the corner office while leaving Mukesh more or less where he was. Rather, Mukesh seemed to be saying, ‘Blame it on Rio’. For Rio, he said, was where he was heading with his kids in July, in time for the Olympics! But, his next venture may only be months away. “After a month, when my transition (out of Flipkart) is complete, I plan on meeting a lot of people, exploring different things. By the end of this year, I plan on starting something new”. But it won't be another e-commerce portal as he continues to be invested in Flipkart. What happens to your baby Myntra now, Mukesh? I think Myntra is in a phenomenal place as an undisputed brand. It is very strongly positioned. It has a very good team in place and a phenomenal CEO. So, as a founder, I feel very good to leave Myntra in such a strong position. And to be optimistic, I believe it will continue to so stay in a very strong position even in the future. Did Myntra turn out quite the way you wanted in these nine years? Absolutely. When we started Myntra, I had three things in mind—to become the largest fashion retailer in the country, to build a unique value proposition for consumers and to build an organisation with a very strong foundation. I think we have achieved all three. And I think in the next five years, Myntra will be one of the iconic companies in India. So, I’m leaving with a feeling of satisfaction. I think what made me most happy was the culture that we built. People in Myntra are deeply connected. I feel the place has a unique personality. Yesterday, when I sent a note to Myntra employees about my exit, many of them came and spoke to me about how much they feel like it’s their own company and how much fun they have and that they really feel connected to the place. I think that’s something I’m most proud of. How did your family react to your quitting? I think my kids were really happy that I would be taking some time off and travelling with them. They are really excited. What are you going to do in the break? What plans after that? I am planning some trips with the kids. Thinking of taking them to Brazil for the Olympics. I think that would be fun. I also plan to read a lot and travel. Also, after a month, when my transition is complete, I plan on meeting a lot of people, exploring different things. By the end of this year, I plan on starting something new. What will be the next venture be? Does e-commerce still excite you? E-commerce does interest me. But, I continue to be a shareholder in Flipkart, and I am very much invested in and supportive of Flipkart’s business. So, I won’t venture into another e-commerce portal. There are other areas that I think are very interesting. Artificial Intelligence is a technology that I think is really taking off in a big way. There are other areas, like sports, education and fitness, that I think can be dramatically transformed. There are also a lot of companies transforming logistics and transport businesses. There are tremendous opportunities in every field. For now I’ll keep an open mind and explore opportunities. Will you be doing a recce of Silicon Valley to spot the next big thing? I have a strong network in the Valley, so I will plan some time to meet people there. There is a lot happening in the Valley which is very inspiring. I read a lot of non-fiction, from science to history to biographies. I also like reading classic literature. I’m reading Bill Bryson’s “A Short History of Nearly Everything” and Gabriel García Márquez’s “One Hundred Years of Solitude.” Both are really fascinating books.